It might not be immediately obvious to equate a Swiss watchmaking brand with over 150 years’ experience and expertise with innovation and a pioneering style, yet that’s exactly what TAG Heuer stand for. The son of a shoemaker in the small town of Brugg in the north of Switzerland, Edouard Heuer started his own watchmaking business at the age of just 20. In 1882, twenty-two years later, he patented his first chronograph in what became a long line of firsts. A love of motor racing prompted a desire to measure time in increasingly smaller intervals and in 1916, Edouard Heuer’s son Charles-Auguste gave the world the first stopwatch, accurate to 1/100 of a second. The brand was quickly embraced by the sport and their timepieces were worn by professional racers and fans alike. 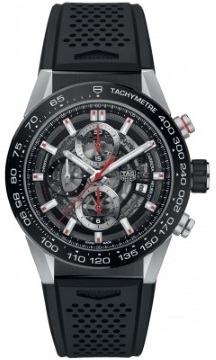 TAG Heuer even became the first extra-terrestrial watch manufacturer, with one of their stopwatches having been worn by astronaut John Glenn when he piloted the Mercury Atlas 6 spacecraft in 1962 on the first manned space flight to orbit the earth. Here we take a look at a selection of TAG Heuer watches for both ladies and gentlemen that beautifully illustrate the stylish innovation the brand has become famous for. The influence of motor racing on the design of the TAG Heuer Formula 1 Quartz Gents’ watch is reflected in the detail with a jet-black dial and luminescent hour markers, set off by the sapphire crystal glass. The 41mm stainless steel case adds a stylish contrast with the black, perforated rubber strap and unidirectional bezel in black titanium carbide-coated steel. 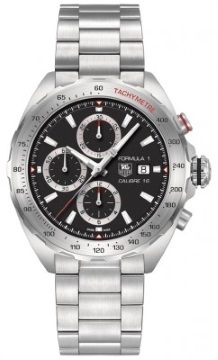 With a water resistance up to 200m, this watch is ideal for the sport-loving gentleman and is available at £850 or just £14.17 per month on 0% finance over four years with a £170 deposit. 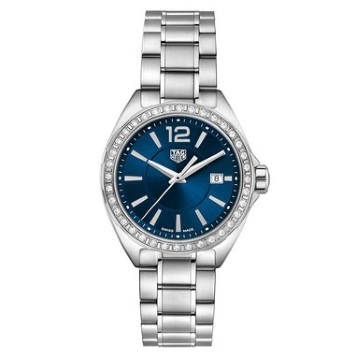 The TAG Heuer Formula 1 Ladies’ Steel 32mm watch was first introduced at Baselworld in 2018 and is an elegant and classy addition to the range. The 32mm case is beautifully presented on a stainless steel bracelet and features polished steel hands on a blue sunray dial complemented by hand-applied baton markers. As practical as it is stylish, the scratch-resistant sapphire crystal has had an anti-reflective treatment applied, and an easy-grip screw-in crown controls the fixed sixty-minute scale bezel. 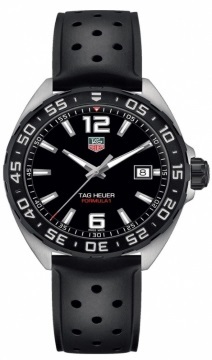 This watch is available for £950 or just £15.83 per month on 0% finance over four years and with a £190 deposit. The inspiration of motor racing is clearly evident in the design of this striking watch with its distinctive tachymeter bezel and three chronograph counters with red-tipped hands. The TAG Heuer Calibre 16 automatic movement and rapid date correction on this TAG Heuer Formula 1 Automatic Chronograph with approximately 42 hours’ power reserve ensures that you’ll never miss a beat with this timepiece. The sporty yet sophisticated look of this watch is underpinned by the black dial and luminescent hands with polished indices which have been hand-applied for that extra touch of luxury. The scratch-resistant sapphire crystal and a 44mm stainless steel casing provide reassuring protection. This watch is available at £2,250 or just £37.50 per month on 0% finance over four years with a £450 deposit. 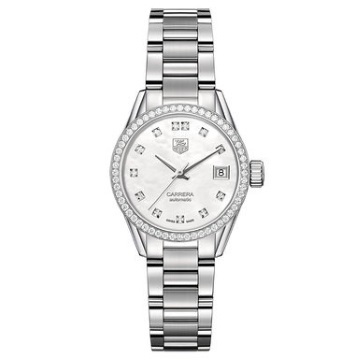 As with all other watches in this range, the TAG Heuer Formula 1 32mm Ladies watch draws on the world of motor racing for its inspiration and adds a glamorous twist with a sparkling diamond-filled bezel set on a 32mm stainless steel casing mounted on an alternate finishing steel 5-row bracelet. The blue sunray brushed dial is strikingly offset by rhodium-plated polished hands and baton markers all protected by flat sapphire crystal. Water resistant to 100m, this watch combines sophisticated elegance with Swiss quartz movement to bring you a luxurious and reliable timepiece. Available at £1650 or just £27.50 a month on 0% finance over four years with a £330 deposit. 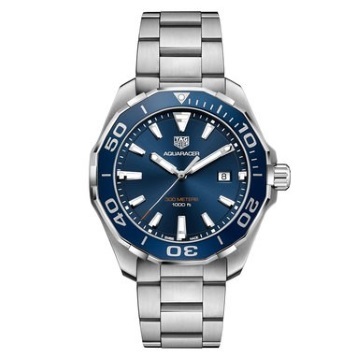 Although this TAG Heuer Aquaracer Quartz 27mm Ladies watch is designed with water sports in mind – as the name suggests – this stylish chronograph is refined enough to wear on any occasion. The Superluminova hour markers and hands sit elegantly against the blue sunray brushed dial and fully complement the 27mm case and polished and brushed stainless steel bracelet. Powered by Swiss-made quartz movement and able to withstand water depths of up to 300m, this watch strikes a perfect balance between practicality and high-end fashion. Available at £1100 or just £18.13 per month on 0% finance over four years with a £220 deposit. 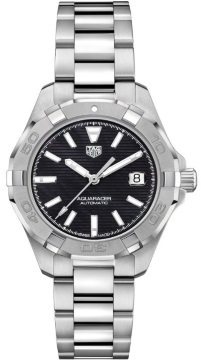 Like the Formula 1 Ladies 32mm equivalent, this TAG Heuer Aquaracer Ladies 32mm Automatic watch made its debut at Baselworld in 2018 and beautifully combines a sporty influence with elegant design. The hour and hand markers are Superluminova-filled and brighten up the dark dial and stunningly enhance the 32mm stainless steel case and polished bezel. With automatic movement and water resistance up to an astonishing 300m, this practical watch – showcased on a stainless-steel bracelet with a scratch-resistant sapphire crystal – is a sophisticated twist on a sporting theme. Available at £1600 or just £26.67 per month on 0% finance over four years with a £320 deposit. This contemporary timepiece, with its distinctive horizontal streak on a bold blue dial set on a modern fine-brushed and polished steel bracelet, is the epitome of style and practicality. 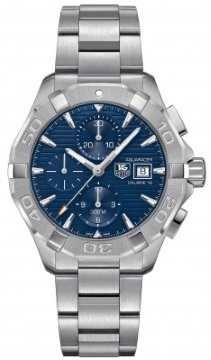 The TAG Heuer Aquaracer Automatic Calibre 16 Chronograph Men’s watch is water resistant to 300m and has luminescent markers on the hands and markers to help you keep track of time underwater or in the dark with chronograph hour, minute and second markers at 6, 12 and 9 respectively. Powered by 16 calibre automatic movement and with an impressive 42-hour power reserve, this masculine watch is perfect for those underwater expeditions. Available at £2650 or just £44.17 per month on 0% finance over four years with a deposit of £530. 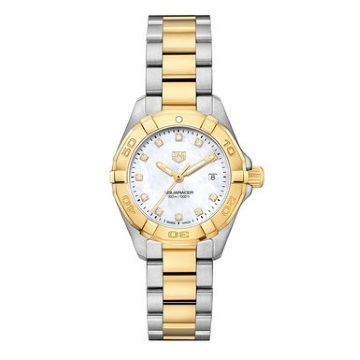 The TAG Heuer Aquaracer Ladies 18 carat gold Bezel watch is the ultimate in sporting glamour with its gold-plated unidirectional bezel set on a beautiful gold and stainless steel-plated bracelet which contrasts beautifully with the white dial. Securely protected by scratch-resistant sapphire crystal, the golden hands and diamond hour markers add a feminine style and luxury feel to a highly-usable watch that is water resistant to 300m. Boasting Swiss-made quartz movement, this exquisite watch blends reliability with an elegance that can be worn for sport or any other occasion. Available at £2100 or just £35 per month on 0% finance over four years with a deposit of £420. 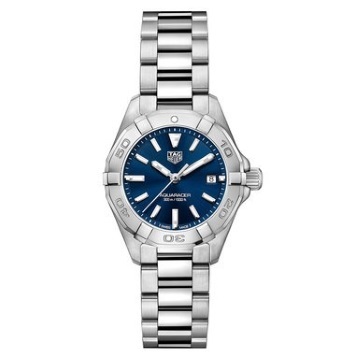 Perfectly picking up on the water sports influence in its design with the blue anodised diving bezel, red-tipped second hand and 300-metre mark, the TAG Heuer Aquaracer Men’s watch is a classic addition to the range. The brushed blue dial with striking white hour hands and number markers sits under scratch-resistant sapphire crystal and is beautifully presented on a masculine yet stylish brushed stainless-steel bracelet. With Swiss-made quartz movement and a water resistance of up to 300m, this is a reliable, practical and stylish chronograph which is perfect for the active gentleman. Available at £1400 or just £23.33 per month on 0% finance over four years with a deposit of £280. 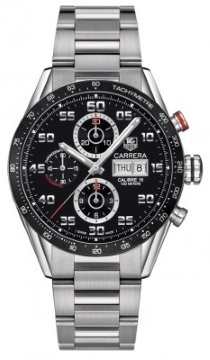 With a nod to TAG Heuer’s classic and iconic timepieces, this TAG Heuer Carrera Calibre 16 Day Date watch features a scratch resistant black ceramic tachymeter bezel set on a 43mm case and fine-brushed stainless steel bracelet. The black of the dial is lifted by silver-tone hour markers and picked out by the flashes of red on the second hand and the three chronographs that measure seconds, chrono minutes and hours. A day and date window sits at 3 o’clock to provide a striking watch that, with Calibre 16 movement, brings dependability to a classic style that will stand the test of time. Available at £3850 or just £64.17 per month on 0% finance over four years with a deposit of £770. The TAG Heuer Carrera Diamond Automatic Ladies watch is a delicate and elegant take on an iconic timepiece. The mother-of-pearl dial beautifully enhances the 12 Top Wesselton diamonds that mark each hour and the polished and faceted hour and minute hands. The polished steel bracelet wraps around the delicate 28mm stainless steel case with a polished steel fixed bezel which is beautifully finished with 56 Top Wesselton diamonds for the ultimate in luxurious style. The scratch-resistant sapphire crystal and the Calibre Sallita SW1000 automatic movement, along with a power reserve of approximately 40 hours, make this a truly stunning and classic watch. Available at £3850 or just £67.17 per month on 0% finance over four years with a £770 deposit. 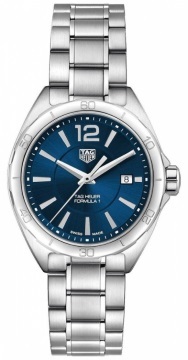 This striking timepiece is a slightly smaller version of the TAG Heuer classic and retains many of the same features. The black dial on this TAG Heuer Carrera 01 Automatic Chronograph 43mm watch is skeletonised to reveal the intricate inner mechanism, illuminated by the white SuperLuminova hour markers and hands for optimum visibility. Three chronograph subdials, a red second hand and red flecks on the hour batons add a stunning touch to this classic design. The perforated rubber strap with 43mm case in brushed and polished steel and scratch-resistant sapphire crystal with double anti-reflective treatment adds a robust masculinity to this iconic piece. Available at £4300 or just £71.67 per month on 0% finance over four years with a £860 deposit. With fans the world over and 150 years of watchmaking, it’s not surprising that TAG Heuer count amongst their brand ambassadors’ well-known names such as Ayrton Senna, Alexander Rossi, Cara Delavigne and Bella Hadid. Shared values, such as a love of adventure, a pioneering spirit and classic style, naturally draw people to the TAG Heuer brand, so if you want to be a part of what that represents, take a look at our range of TAG Heuer watches.